Just a quick, amusing bug in the site. This is presumably the result of PoV simply ripping out the code that presents the LD32 game pages, which means the site defaults to taking you to the page of the post with the permalink “ludum-dare-32”. I suppose this is just while they’re processing the votes. It’s sort of funny, just thought I’d share. …but I’m just not feeling it this LD. I always look forward to this 359 days each year. I’ve participated in every Ludum Dare since LD23. I’ve loved it every time. Except this one. I’ve got a pretty good idea. You play as an evil spirit who needs to collect souls by possessing inanimate objects and getting people to attack each other with them. But I find that I really don’t feel like making it. I feel like having a relaxing weekend, trying some games on my new PC, stuff like that. And I guess I’m not surprised. The past three weeks at least – probably more – have been really busy and really exhausting for me, and, until next weekend, there isn’t an opportunity for relief in sight. The only reason I haven’t decided to call it quits is because I would then me doomed forever to say “I’ve participated in every LD since LD23 except for one.” I hate disclaimers like that. I guess I’ll spend the rest of today relaxing and hopefully I’ll have an idea both fun and possible to make in one day. And now for a second prototype. It hasn’t been that long since I posted my first prototype, but now I’ve already got a second one for you to check out. Click the screenshot to try it! And he has no idea that there’s a very specific reason for this odd name. There’s no goal to the game yet, but the first signs of my main mechanic are beginning to show. Click the screenshot to try it! Engine: The Spanner Engine, which I’ve been making using HaxePunk for my upcoming game, Spanner in the Works. Since the engine isn’t the part of the game people will be paying for anyway, I plan on making it open-source under an Apache v2 license, even though that’s not a requirement for the Jam. I’ll have to get the code cleaned up a bit and separate it from the game itself first, though. Sprite Graphics Editor: Inkscape. The Spanner Engine uses vector graphics, so I’ll have to use a vector graphics editor. I may or may not use a graphics tablet for anything, it depends on the style I decide to go with. 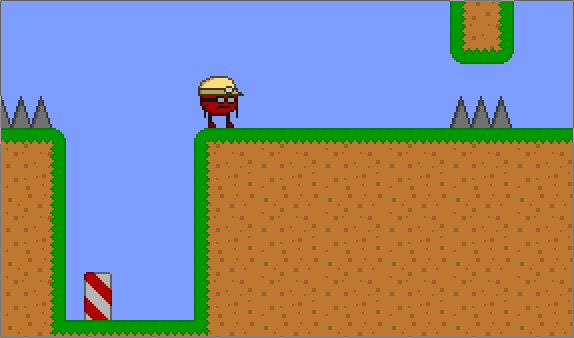 Tilesetting: The Spanner Engine handles tiles in a sort of odd way, so a tilesetting program won’t be necessary. And besides, I very much doubt that there’s one that can handle SVGs. Sound: Either jfxr or a microphone, Freesound.org, and Audacity. Because this isn’t going to be a retro, pixelated game anymore. Animation: Synfig. It’s the only program that is capable of exporting to the Spanner Engine .anim format. Not directly, but through a Python script I wrote. I’m not complaining about my limited options, of course, I am the one who chose Synfig for this purpose! It’s a nice program. “But, Pitzik4!” you may be thinking. (I’d say there’s about a 10% chance you’re thinking this.) “Vector graphics? Cut-out animation? There’s no way you’ll be able to make this look good and get enough coding in to make a good game!” You’re right. That’s why I didn’t plan on using the Spanner Engine originally. But then I joined a team: Pitzik4, misson20000, and JML64 (who doesn’t have his own LD account yet). I am going to be the team artist. Which means I won’t be programming very much. Which is… quite terrifying, to be honest! Programming is certainly my strong point, and it’s been my main focus during all seven of the LD’s I’ve participated in so far. misson20000 is a very competent programmer and I trust him to do a good job, but there’s a very big part of me that really doesn’t want to trust anybody but me with such an important task. There is a chance that working in a team like this and using the Spanner Engine won’t work out and the result will be awful, but I think it will be good to try something new this LD. If things don’t go well, it’s not the end of the world, as Ludum Dare 28 taught me. It’s an opportunity to learn something. So, good luck to all of you (and to me)! I’m looking forward to seeing what we all make! Looking at some past LD’s, the I’m In posts probably won’t start naturally for several more days. I’m going to see if that’s because a lot of people don’t start visiting the website until close to LD or because they’d rather write their post when there are other people writing theirs by seeing if this post triggers an early start for the flow of “I’m in”s. It’s not a perfect experiment, but we’ll see what happens. Anyway, this is my, what? Eighth LD? Wow, it is. I’ve participated in every single LD since #23, I wouldn’t miss one for anything. Almost. I guess I’d miss one for a million dollars, or for immortality, as long as it comes with eternal youth and health and a guarantee that humans won’t blow themselves up and leave me all alone. But I’m probably not going to be offered either of those things in the next 20 days. Engine: HaxePunk. HaxePunk has served me excellently in the past, and I’m actually making Spanner in the Works, my first large-scale game, with it, which has vector graphics. Go figure! Sprite editor: Aseprite. Buy the $10 version. The only reason I didn’t is because I’m a cheapskate. You don’t want to be like me, do you? Tilesetting: GoTile. I made this one! Whoopee! It’s totally free and stuff. Go get it, it’s sort of like AutoTileGen if it had been made in 2 days. Text editor: Sublime Text 2. You know, this list is starting to look suspiciously… identical… to the one I posted last Ludum Dare. Timelapse: gLapse again. But this time, I’ll turn the quality up higher. My last timelapse looked, well, disgusting. Because that’s what JPEG artifacts look like! Disgusting! Blech. Streaming: Not doing it this time. Nope. Sound: jfxr, made by our own Frozen Fractal and announced in the post right before this one! Let’s give him a round of applause for bringing us the third generation of Ludum Dare low-tech sound synthesizer software that really blows away both of the previous ones. Oh, and I’ll also possibly use Audacity. And maybe even LMMS, if I’m feeling bold. So, best of luck to everyone! I don’t expect to get another medal (certainly not another gold one), but I do expect this to be a lot of fun, because that’s what prior experience would suggest. I’ll have to start going to bed at midnight and getting up at 8 a.m. by then, though, because going to bed at 1:30 a.m. and getting up at 11 won’t work for several reasons. So, let’s all make some games! (In 20 days.) Wahoo! I made a game called Meddle for Ludum Dare 29. It won first place in Innovation. 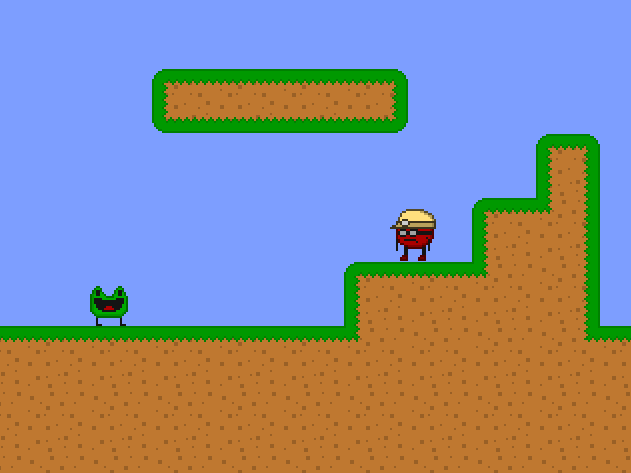 Obviously, I wasn’t just going to let an award-winning idea sit there and die in a little 7-or-so-level game without making something bigger, so I decided to postpone my other projects indefinitely to make a post-compo version of Meddle. I renamed it to “Spanner in the Works” because “Meddle” has three homophones to get confused with (in my accent, anyway): “metal”, “medal”, and “mettle”. I have many ideas for Spanner in the Works. I have the beginnings of an interesting (and secret) story, and also some new graphical utilities that will let me use SVG graphics with animation from Synfig in HaxePunk. In introspection mode there will be monochrome, pixelated graphics along with the matrix-style text from the original, although I don’t know whether to make the sprites green on black or black on green. I also don’t know whether to give the player just one command slot, like in the original, or multiple. Suggestions are welcome. Look at how much he’s grown! I think that’s it. There is now nothing else to say. If I say anything more at this point, it’s probably pointless. So it’s a good thing I’m not saying anything. Yup. If I kept saying stuff, that would be such a waste of time. Good job realizing when it was time to stop and stopping, me. How did I do this?? I got first place in Innovation. What can I write about this? I don’t even know. I really like my game this time. It’s a puzzle platformer – give it a try! This is probably the best thing I’ve ever seen in the #ludumdare IRC. “(Quit)”, in case it wasn’t clear. I’ve got a puzzle! And, this may not sound like much to you, but… I think it’s actually a good puzzle! I’ve never made a good puzzle before, but this one’s good! Hooraaayyyy! Try it out immediately! Also, level 1 is designed for messing around and getting used to the controls. Try playing it for a bit! So, you know those little mini-themes that have been in the past… how many Ludum Dares? Things like “Goat”, “Potato”, and… “Bieber”, I guess was one. Usually just showing up as little Easter eggs, but in a lot of the games. Those were all failed themes in the voting, I think, but whatever. How about this for a mini-theme for LD29: the Konami Code! Up, up, down, down, left, right, left, right, B, A, start/enter. Just make something happen in your game when the player enters the Konami code! Some sort of Easter egg. It will be fun! Wow, it’s like an NES controller with no style. So, that’s all. I’m definitely putting this code in my game! I hope to see it in some of yours! 42 queries executed in 0.121 seconds.